'...very beautiful and moving poems in the collection.' Brian Patten. 'Like imagery on LSD'. Sophie Hannah. 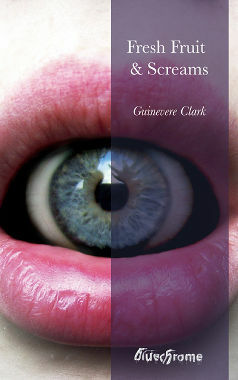 'Clark revels in language...her poems offer one startling phrase after another...' Angela Topping. 'Unerring quality' - Ronnie Goodyer. Fresh Fruit and Screams is a vivid collection of poetry travelling through sexual highs and lows, club culture, urban depression and spiritual awakening. Guinevere even attempts to re-write a few hard and fast tales, broaches contemporary politics and offers heart felt comment on the world's conflict. There's a definite Mother Earth feel to her work. She reveres the natural world exploring stunning seascapes, magical forests and megalithic monuments. There is humour in Guinevere's poetry as well as deep metaphysics. Her work ranges from autobiographical to pure fantasy, or is it? She writes with awe, passion and emotional intelligence. Fresh Fruit and Screams is a cornucopia of rare and engaging poetry which seems to touch on all things important. Here is a new and exciting voice to contemporary poetry. 'There's at least one wow moment in every poem.' Barnaby Legg.